There are some fundamental changes required to create intelligent roadways. Electronic nodes could be installed, perhaps as nanopaint, and applied to the sides, lanes, and center of roads, starting with the freeways, highways, and major commuting routes. Additionally, the cell phone networks could be filled in with deep capacity along the same routes providing high speed wireless Internet to vehicles. Cars and trucks could be equipped with wireless radios and navigation systems that interact with the traffic control nodes and with other vehicles – every one being an intelligent node. Combine this with satellite radios, accurate GPS triangulation, radar, and all vehicles would be embedded in a redundant virtual transportation grid. All vehicles would be in sync, anticipating the others moves, perhaps sharing destination information so that they know when a vehicle will change lanes, which exit they will take, which lane a car entering the highway intends to enter, etc. Think of this as a machine omnipresent transportation experience. Google driverless cars are glimmers of this future. The driver, er passenger, would speak directions to their vehicle or perhaps the vehicle would interrogate the passenger’s smart phone’s calendar to see where they are to go, and off they go. The passenger, can go about their business of reading, e-mailing, social media interaction, writing, planning, thinking, sleeping, etc., while their vehicle safely and swiftly gets them to their destination. Perhaps commuters could negotiate with their employers for travel time work credit. Rather than work days extended by 2-3 hours of travel time, a portion, perhaps 75% of the travel time would count as work time. Of course this would only apply to office, information, knowledge type workers but that would be a significant benefit for many people. Vehicles would routinely and safely tailgate because they will know what to expect and when. Traffic will flow at very high speed and with little to no accidents (assuming the bugs are carefully worked out). When vehicles do leave the smart roads, say to enter a suburb that hasn’t converted yet or a rural or remote road, the vehicle would instruct the passenger to be ready to take control and become the driver. Eventually most roads would be part of the new grid and only very remote and rural areas would require human drivers to be involved. Perhaps though, new technology involving laser, radar, video, sonic, and satellite radio / GPS techniques would enable driverless vehicles to even work in those areas. Vehicles would likely in this scenario, be fully electric. Perhaps the road ways would be coated or embedded with a solar nanoelectric charging surface which enables vehicles to trickle charge all the time, always having maximum capacity. This system would be more efficient, time effective, safer, faster, and better for the environment. Imagine the freedom for disable persons. A person who has lost their site, can now get to places on their own in an intelligent vehicle. Google’s research in this area is remarkable. Add smart roadways to the mix and it could be the perfect transportation system. For me, I would embrace this future car instantly – it would transform a stressful, dangerous, time wasting commute into a relaxing and productive experience. Thinking selfishly for a moment, I will retire in less than 10 years so I really hope this becomes a reality before then! If not by then, when it does, 100’s of millions of people’s lives will be transformed for the better when this is a general reality. How about you, what do you imagine for the cars of the future? I know, the title sounds kind-of retro, something from the 60’s, but let’s not go there. I read and write a lot about machine power and how machines are increasingly taking over roles in society that were previously thought to be human only. As this inevitable trend plays out, it will be increasingly important to be crystal clear about the role of people in the economy and society in general. We seem to be on an unwavering trajectory to a highly automated and robotic future so why not leverage that likelihood to the people’s advantage. Let’s be sure to keep our roles up front and center in this brave new world that’s unfolding. I remember as a kid hearing about some utopian future where machines did the work and people sat around enjoying their leisure. That doesn’t sound too bad actually. However, a good part of what drives us humans is the need to contribute in meaningful ways to meaningful initiatives. Work is actually a innate need built in to us. I love my job, it’s exhausting, stressful, but super fulfilling at the same time. It’s part of my purpose. I suspect most people deep down feel the same way so let’s not give it all away to our machines. So, what might the future of people power be in an automated robotic future? When people are enabled, supported, and networked, great things tend to happen. The mixing of ideas amongst diverse people results in breakthrough innovations. We need to design new physical work spaces and practices with mixing and true collaborating in mind. Google is on to something at their GooglePlex facility if the stories we hear are true. 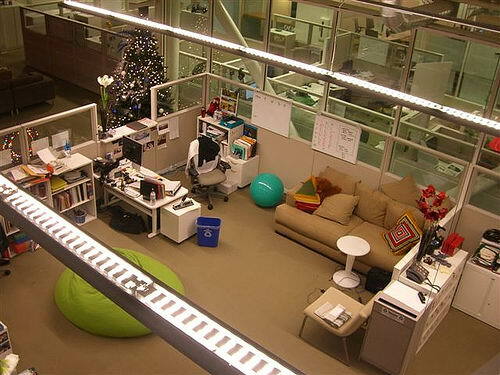 They have funky open collaborate spaces, slides between floors, game rooms, and swimming pools. Perhaps we can’t afford spaces like this in our schools and School Board offices but certainly a less institutional design would be helpful. In my visits to new schools in Vancouver such as Kitchener Elementary, I’m encouraged by the new design thinking. This school has varying sized classrooms clustered in learning communities that include shared learning spaces that spill out into the halls. Rooms open up between them to make larger spaces when necessary. There are larger commons, small nooks, benches built into walls below windows, spaces that spill outdoors, etc. It’s important to work on the needed shift in practice with teachers so they can maximize the benefits of funky learning spaces like this. Often schools skip the culture preparation step and these spaces end up being used as traditional classrooms are and the benefits of mixing and learning in new ways, are lost. It’s important for kids to learn to mix ideas, work collaboratively and cooperatively, to be creative, to be allowed and encouraged to think outside the box, to learn to push the boundaries and not learn in containers. This generation will be faced with a automated machine run future in the 2020’s and 2030’s and it is imperative that they learn to maximize people power, through togetherness. Learning from school contexts, how can we disrupt and rejig our office spaces? How can we help our work teams shift to new models of mixing, learning, collaborating, and maximizing their collective wisdom? Add new or future technologies into the mix and we get an amplifying effect. Technology in its bare essence is an amplification tool. We need to expand our networks. In physical spaces we can only connect, learn, and work with so many people, maybe a few dozen actively. But through current and future social networking tools, the possibilities to mix and connect are limitless. I recently visited with a teacher in our Vancouver Learning Network (VLN) school – an online, sometimes blended, model of schooling. He took me through the Desire 2 Learn (D2L) learning platform showing me how courses are created and how students access them, how teachers get analytical data from the tool, etc. D2L even checks the work students hand in online for plagiarism automatically through TurnItIn and gives a color coded percentage indication of a problem (machine algorithms at work). Although D2L is a powerful tool for online learning, I think we need more immersive ways to connect learners. Tools like ActiveWorlds and AvayaLive Engage will continue to evolve to the point where the blur between reality and virtual will be indistinguishable. I believe these types of environments will increase people power on a global scale. Once they get past the gimmicky game feel to a real world experience but also taking the advantage of a place where anything is possible, people could be enabled in ways unimaginable. As the people, from around the planet, work together discussing new ideas, imagining solutions to new problems, machine intelligence would be at the human’s beck and call to put their ideas into products and solutions (virtually) at no significant cost. I want this! I prefer to operate in the idea space more than the build-it space. With a place that can implement your ideas in a flash, you could rapidly prototype with virtually located colleagues and speed up the idea to prototype process significantly. Attach future 3D printers that can leverage a vast array of input materials and produce products of varying sizes in super high resolution, and ideas can go from collective brains to virtual prototypes to actual products of all shapes, sizes, and purposes in a very short time. In the future, people power will likely never include grueling brutal physical labor, rather it will mean relationship forming, thinking, idea storming, communicating, cooperating, and creating. Our machines will assist us in this but also take on most or all of the physically taxing labor. This future will free us to meet our physical needs through sport, exercise, and connections with the outdoors rather than through often harmful physical work. Here’s to the Power of People! Remember back in the early days of Internet search when there was no predictive hints provided? You had to know how to find things online (Internet quests anyone) and that took quite a bit of experience, thought, and luck. Then, about 3-4 years ago, Google searches started predicting the next word and then possible complete searches based on the words you typed. This is the magic of a predictive algorithm. Essentially Google is referencing the words you type to previous other billions of searches with those words and offering up neighboring search terms they’ve seen before. Google is learning from our billions of daily searches what we typically look for. 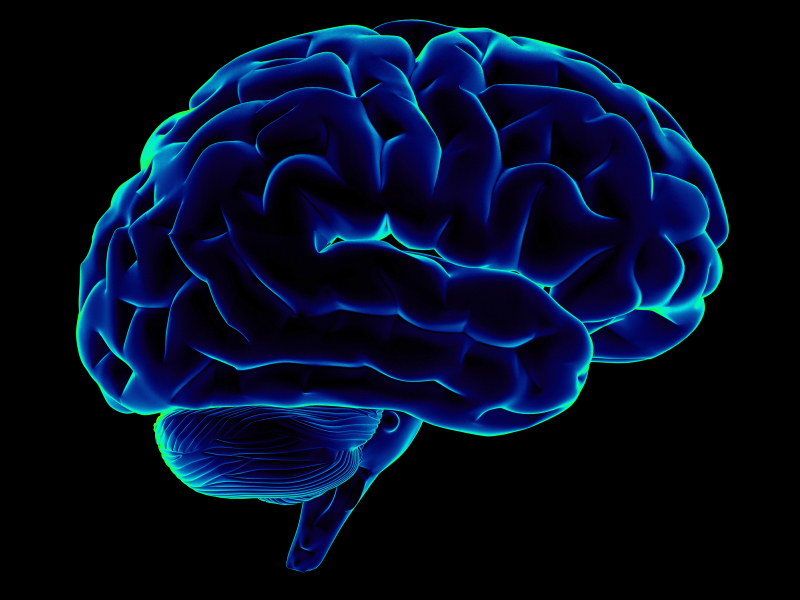 Our neocortex is virgin territory when our brain is created. It has the capability of learning and therefore of creating connections between its pattern recognizers, but it gains those connections from experience. Kurzweil, Ray (2012-11-13). How to Create a Mind: The Secret of Human Thought Revealed (p. 62). Our brains have sophisticated pattern recognizers. Research by Ray Kurzweil suggests massively parallel sets of recognizers are at work predicting the future (next letter, next word, next decision, etc.) based on what has been learned and observed in the past. Sounds very much like Google’s algorithm for predictive search doesn’t it. There are brilliant mathematicians researching and inventing new algorithms to speed up processes, to overcome human limitations, etc. It is mind boggling where this is heading. 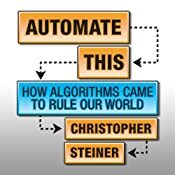 I’m currently listening to the fascinating Automate This: How Algorithms Came to Rule Our World on my iPhone on my return commute. The author describes in detail how stock markets began to be “hacked” by algorithms in the 60’s and today nearly 70% of all trades world wide are done without any human involvement! Algorithms “decide” in milliseconds what to buy, sell, whether to put or call, how to hedge, etc. They “earn” pennies per trade but when there are 10’s of millions of trades, this adds up. The other key is to be first in on a trade and first now means 3-4 milliseconds sooner than the next person, er, machine. Algorithms can run amok though – “May 6, 2010, when a "flash crash" inspired a short-lived Dow dive of almost 1,000 points” (USA Today). “Computer algorithms are too fast, and can jump on trends faster than humans, he says. ‘This is analogous to the flash crash,’ Feiger says. ‘We have created a market-trading structure which is driven by short-term math decisions that capitalize on quick market movements. Machines don't forecast the future of Europe.’” (USA Today). I predict it’s only a matter of time before machines (algorithms) can predict world events better than humans and catch their errors in judgment sooner. Another example shared in Automate This involved music and the ability to break it down into its mathematical parts to uncover its patterns. Algorithms have been used to create profiles of hit/successful music and then used to match unheard music to these profiles to predict new winners (see Can an Algorithm Beat Simon Cowell at His Own Game?). Apparently software was used to predict Nora Jones great success in 2004 at the Grammy Awards – “She has been the recipient of several Grammy Awards; Come Away with Me was nominated for two awards at the 45th Grammy Awards. Jones personally received five of the eight awards for Come Away with Me. (Wikipedia 2013). Algorithms have been used to generate music (also see Intermorphic) – the book talks about generating Bach like music that humans could not distinguish from the real thing. In other words machines can be taught to be creative and surprising musicians! So how does this relate to education. I suspect most people believe education to be a fundamentally human discipline, as do I. However, I think the rapid rise of algorithms and Big Data might force us to reconsider to what degree. I referred to Ray Kurzweil’s book and research earlier and If you really want to blow your mind, read his book. His goal is to map the brain’s functions, break them down into modules, and replicate the brain in software (algorithms). His view is that in essence our brains are fundamentally pattern recognizers loaded with “big data” that grows as we experience life. Personally, this is a little too clinical for me – I see our spiritual dimension to be fundamentally important but I’ll keep this more academic. Assuming our brains are big data pattern recognizers, this can, for almost certainty, be replicated with tomorrows technology given the exponential growth in speed, storage, and sophistication of technology. I see this as very disruptive of our view of education, work, and what we think is reserved for humans. We need to actively differentiate ourselves from machine capabilities. Teaching is going to have to move from “teacher” to wise facilitator, social learning organizer, guide, goal advisor, and supportive coach, etc. Content, curriculum, learning activities, assessment, etc. will inevitably be deliverable by machines in the not too distant future so I’m suggest that aught not to be what teaching is about, in the future. I find this somewhat frightening but ultimately exciting. There’s a lot of mundane work involved in our lives that can be replaced by machines. We have the opportunity of a life time to reinvent our purpose in learning, teaching, and work. But, we should be working this out now and be in charge of creating our new future and not leave it to chance! Let’s reinvent rather than be disrupted. This is learning at the core “[t]he principal activities of brains are making changes in themselves” (Marvin Minsky, The Society of Mind).